Krushnamegh Kunte: I am a naturalist broadly interested in all aspects of the biological world, from species communities to genes. I received my PhD in Integrative Biology from the University of Texas at Austin, USA, in 2008. I was a Post-Doctoral Research Fellow at Harvard University, USA, until 2011. In 2012 I joined the faculty at the National Center for Biological Sciences (NCBS), Bengaluru (=Bangalore), as a Ramanujan Fellow. My research lab at NCBS investigates the evolution and organization of biological diversity with a special focus on speciation and morphological diversification in butterflies. Indian butterflies has been my passion for most of my life, and I have studied them since 1991, extensively surveying populations in the Himalaya, NE India and the Western Ghats. 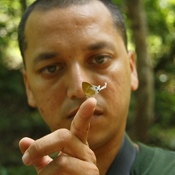 Read more at http://biodiversitylab.org or contact me by email if you want to learn more about my research and writing, the Indian Foundation for Butterflies, this website or Indian insects. Price, B. W., V. Sarkar, K. Marathe, P. Roy, and K. Kunte. 2019. 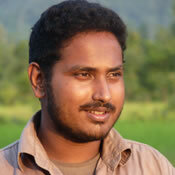 Cicadas Of India Website Team . In Marathe, K., V. Sarkar, B. W. Price, P. Roy, and K. Kunte. Cicadas of India, v. 1. Indian Foundation for Butterflies.